Home Top News Who is Jair Bolsonaro, Brazil’s far-right presidential candidate? Rio de Janeiro, Brazil – To detractors, he’s a dangerous cheerleader of dictatorship. To supporters, he’s the presidential candidate capable of delivering salvation from Brazil’s political, social and economic crises. Jair Bolsonaro, a far-right firebrand and self-styled political outsider, is divisive. He’s also just one election win away from potentially becoming the next leader of Latin America’s largest democracy. On October 28, he will face fellow candidate Fernando Haddad, of the leftist Worker’s Party (PT), in a head-to-head ballot for Brazil’s presidency. Last month he suggested that he would not accept the result if he did not win the election. His running mate, former army general Hamilton Mourao, later walked back those comments. 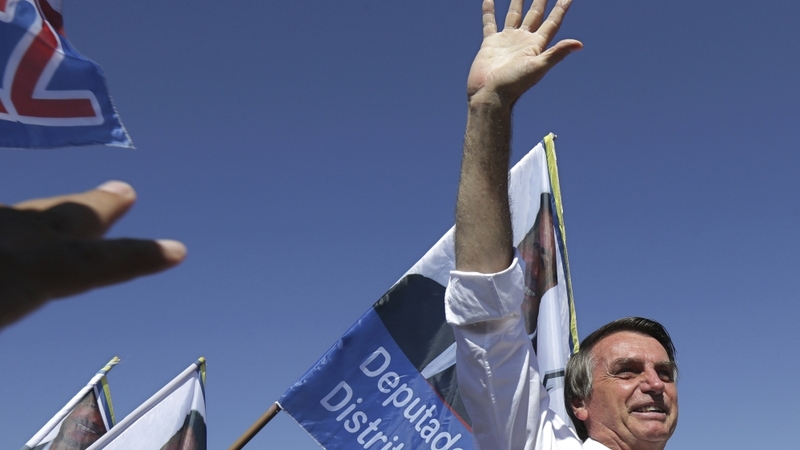 Bolsonaro won a place in the runoff after topping a field of 13 candidates during a first-round vote on October 7 with 47 percent of the vote. The result marked a high point in the 63-year-old’s remarkable recent rise after decades of relative political obscurity. Bolsonaro has served as a congressman for Rio de Janeiro in Brazil’s lower house Chamber of Deputies since 1991, switching parties on numerous occasions. He was hardly known outside the city until 2014, when Brazil slid towards the malaise it now finds itself in. “He was always an unimpressive backbencher, he was never a party boss … or had a programmatic agenda that was of any significance,” Matias Spektor, a professor of international relations at the Brazil-based Getulio Vargas Foundation, told Al Jazeera. According to political analysts, critical to Bolsonaro’s emergence was the convergence of several different crises within Brazil, which have slashed public faith in democracy and the country’s political class. “The overall discreditment of establishment politicians resulting from the worst recession in 100 years, the biggest corruption scandal ever detected – according to the US Department of Justice – and this never ending deterioration in crime and homicide have caused the rise of Bolsonaro,” said Brian Winter, vice president of policy at the Americas Society and Council of the Americas and editor-in-chief of Americas Quarterly. More than 12 percent of Brazilians are jobless, according to the Brazilian Institute of Geography and Statistics, with the economy still struggling to recover from a seismic recession that dragged on for more than two years before officially ending in 2017. Amid the downturn, several high-level corruption scandals erupted at the height of which was a major anti-graft probe known as Lava Jato, or Car Wash. Since 2014, more than 150 Brazilian business leaders, corporations and politicians have been prosecuted – including former president Luiz Inacio “Lula” da Silva – as part of the investigation and other interlocking probes. “The corruption scandals linked to Lava Jato are really quite revolutionary in Brazil, there’s never [before] been this range of action against politicians, public officials and businesspeople… It’s really shaken the establishment,” Richard Lapper, an independent analyst and commentator on Latin American politics, told Al Jazeera. “[And] Bolsonaro has identified with this move against corrupt politicians,” he added. While Bolsonaro has tapped into widespread discontent with the economy and political elites, he’s also played on fundamental fears about security amid widespread violent crime. Violence has surged in many parts of Brazil, home to seven of the world’s 20 most violent cities, in recent years. “Crime is a major popular concern … and it is an issue across the country, which affects all social classes, although the poor most,” Spektor said. Bolsonaro, a former army captain, has pledged to tackle the security crisis by militarising the police, cracking down on criminal offenders by allowing officers greater freedom to kill, and loosening public gun laws. His proposals are unlikely to prove successful, however, according to Spektor. “The solutions he is offering have been shown to have no effect on troubling crime, on the contrary the notion that a tough hand on crime works has been proven incorrect by existing evidence,” he said. In Rio, Bolsonaro’s electoral stronghold, a military takeover of policing since February in response to acute violence throughout the city has coincided with a rise in homicide rates compared with the same period last year. According to Lapper, Bolsonaro’s appeal isn’t driven by well considered policy ideas but rather his ability to present “simple answers to complex problems”, regardless of their efficacy. In his more than two decades in congress, Bolsonaro has only had two of his own bills passed into law, despite having proposed about 170 pieces of legislation. Allesandra Maia Terra de Faria, a professor of social science at the Rio-based Pontifical Catholic University, said Bolsonaro’s strategy has never been about having “a clear plan, or any kind of stability”. “He’s always got one phrase to sum up everything, but which also means nothing,” de Faria said. This rhetoric, however, has enabled him to unite various voting blocs within the Brazilian right, according to Lapper. “There are three bits of the right in Brazil: the nostalgia right, who yearn for the security of the military dictatorship, the social right which is linked to this very big evangelical community in Brazil, and a liberal right who are always railing about the hypertrophy of the Brazilian state,” he said. 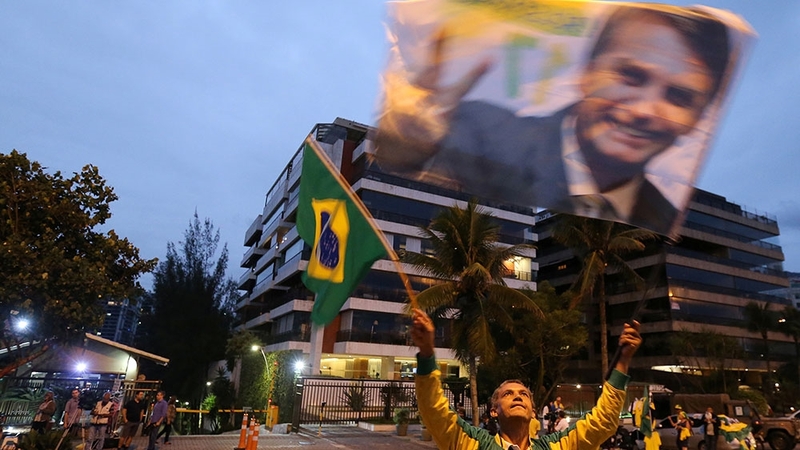 But while Bolsonaro’s bid for office has found favour among some portion of the electorate, his candidacy has also been met with forceful resistance from others. He consistently had the highest rejection rate of any candidate in the build-up to the first round of the vote and, according to Datafolha polling institute, about 44 percent of voters say they would not support him under any circumstances. Haddad’s rejection rate stood at about 40 percent before the October 7 election. 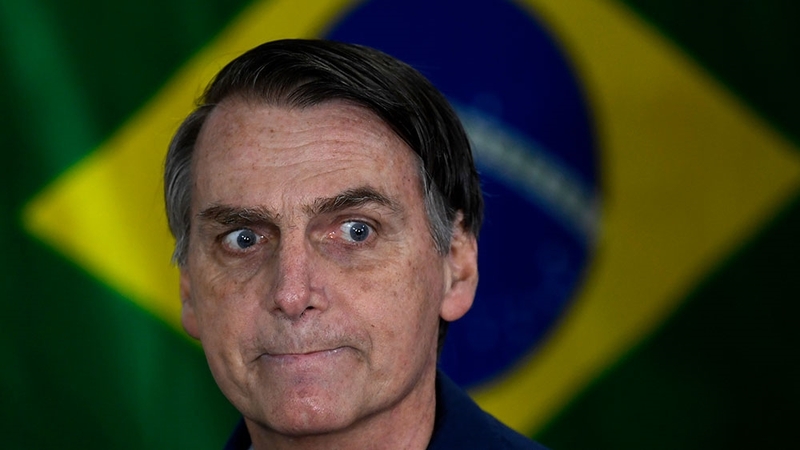 The resistance to Bolsonaro has been driven by his numerous discriminatory comments on race, gender and sexual orientation, as well as remarks in favour of torture and Brazil’s former military dictatorship, in power from 1964 to 1985, which have angered and alarmed millions of Brazilians. Bolsonaro has described having a daughter as a “weakness”, told a congresswoman she was “too ugly” to be raped, claimed some black people were not “even good for procreation”, and said he would rather one of his four sons “die in an accident” than be gay. Last month he was stabbed while campaigning in the city of Juiz de Fora, in southeastern Minais Gerais state. His suspected assailant told authorities he had been “ordered by god” to carry out the attack. 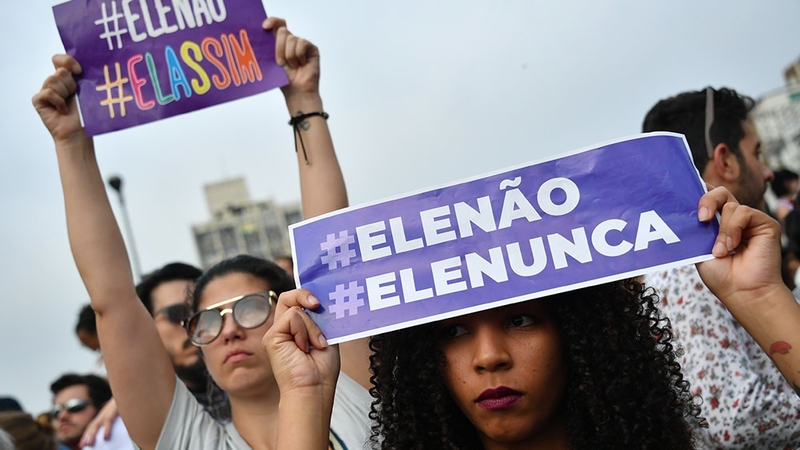 On September 29, hundreds of thousands of people marched in cities throughout Brazil as part of the social media driven and women-led #EleNao (#NotHim) protest against his candidacy. “We have a society in transition and he represents everything that is old and more conservative in Brazil,” de Faria said. Next articleWho is Fernando Haddad, Brazil’s leftist presidential candidate?